I know it’s not quite the end of the year yet, but I’m already eager to share some of my 2012 favorites. This bunch runs the gamut from sweet and spare to all out wacky, and isn’t that the beauty of the picture book? Not all dogs love bones. This odd (and adorable) dog loves apples. And he hates the idea of sharing. Stylish pictures and a quirky tale. Everyone knows that dragons love tacos. But if you’re having a party, be very, very careful when adding the spicy salsa! A parable about materialism, this beautiful book exercises its own restraint. Sparse words and gorgeous illustrations create a quiet wonder. A magpie, some mice, and a lesson in when enough is enough. Hey, who’s in charge of this story? The characters? Or a stubborn pen with a mind of its own? A clever cautionary tale with a hefty dose of artistic inspiration. Koseli just shared a dear story about hearing Maira Kalman speak, and oh, how much I wish I had been with her! This book is a history of America’s 16th president, but the vibrant pink color palette weaved in with lesser known facts make it a fresh perspective. Did you know he loved apples and Mozart? This story of friendship is endearing enough to rival old Frog and Toad. Add in some applesauce, oil cans, and accidental naptimes and ask yourself: is Boy + Bot an instant classic? AFFIRMATIVE. Oh, the pictures in this book. Eye-catching and alive, and very, very sweet. A loose rendition of a popular Hindu myth joined by a dashing mouse and jawbreaker ladoos! When you see green, don’t you think of life and growth? This gem explores the many kinds of green, asks you to interact with its tactile pages, and will surprise you at every page turn. Leave it to a potato to turn the tables on a kid’s favorite saying. A potato? A potato bored of KIDS? Why not? An ultimate triumph for imagination. Ever had a hard time falling asleep, but find yourself in awe of the magical rhythms of the night? Then meet the Insomniacs. The illustrations are as mysterious as the dark, and just as beautiful as the words. Rough day in the terrible two trenches? Snuggle up with Boy + Bot. Need a gift for that hard to please little one? I’m Bored will surely get you some extra hugs. Tired eyes need a pick me up? Stare at the gorgeous pages of Ganesha’s Sweet Tooth. Hard time falling asleep? Settle in with The Insomniacs. And if you’ve ever wanted to write a different ending to your story, sit a while with The Obstinate Pen. 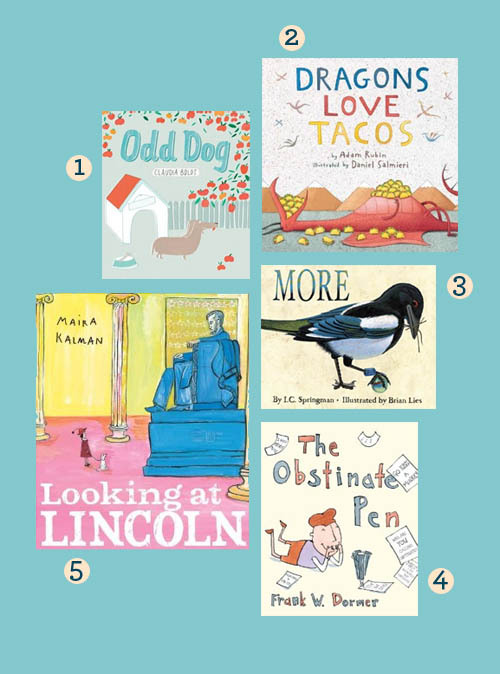 I love these kids’ books round-ups – we’ve found so many new favorites from your posts. Thanks! My son (along with his parents) roared with laughter when we read The Obstinate Pen. Oh DUH, I just clued in to the fact that Carter wrote this list, not Gabrielle. THANK YOU, CARTER!!! question…You once posted about a pop up french book from areas of France on your website and I have been looking and looking and I have not been able to find it again. What is the title of the book? I need to buy a few for my daughters 2nd grade French Teacher. My 7 year old is in a French Immersion program – speaks beautiful French I might add :) and the teacher came from France to teach and I thought it would be fun for him to have a piece of home. Can you give me the name of that book? Please? Oh man, one more (and then some) to add to my monster collection, too! Thanks for the tip, ladies! Um abraço from de other side of the world ! i just discovered your blog and i’m liking a lot ! Love these books! I think Laura Vaccaro Seeger is something of a genius, and I can’t wait to check out others I don’t know yet! I love these book recommendations. I submit the list to our library and I have a great pile to pick up when we go. Thank you! Fantastic! I’m always on the lookout for great picture books (http://palecetacean.com). 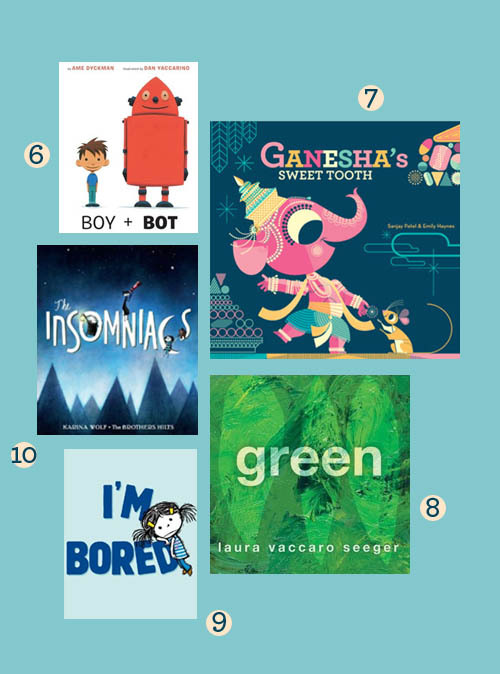 I’ve even seen Ganesha’s Sweet Tooth at the library and haven’t picked it up yet! I’ll be sure to next time I go.